Designer Pro is the solution for all types of graphic design work, whether it's vector illustration, DTP, photo editing or composition, web graphics or websites or even Flash animation. Here we take an in-depth look at the main features. Xara Designer Pro has one of the world's most sophisticated, high performance vector rendering engines. For the user this speed means less wait, and a more satisfying working environment. It also means more productivity and the ability to create more complex drawings, in less time. Many graphics packages will keep you waiting a few seconds while objects are drawn on the screen. In a complex document that can mean you waste a significant amount of time. With Xara Designer Pro, when you create an image it appears instantly on the screen. Speed isn't just restricted to creating and moving objects though - any time you manipulate an object by using one of the Direct Action Tools or the Color Editor for example, any changes you make also appear instantly. This constant live-preview of all actions contrasts dramatically with other programs where you typically have a 'try it - wait - try it again until you get it right' approach. Xara Designer Pro's Direct Action Tools allow you to create effects such as transparency, bevels or gradient fills by selecting the tool then dragging over the image itself to affect the required change. For example you can drag across an object to apply a graduated color (in the fill tool) or transparency (in the transparency tool), or drag on a shadow to position it (in the shadow tool), or drag on an object to rotate it in 3D (in the 3D extrude tool). Traditionally, to apply these sort of effects you would need to enter values in a dialog box and they are transferred to the drawing. With Xara Designer Pro's Direct Action Tools, you can apply all these effects on the object itself - without having to enter any numbers in a dialog box! And the changes take place instantly - it's as close to using your hands as you will get with a graphics package. This is a BIG advantage, because it not only saves time, but also keeps the creative work and the image itself at the center of your focus. It makes experimenting with effects and settings much easier too. Direct Action Tools include the Bevel, Shadow, Transparency, Fill, Contour, 3D Extrude and Blend tools. Many tasks in Xara Designer Pro benefit from being able to use the drag and drop principle, which is more intuitive and a great time saver. For example, when changing the color of an object, you can just drag a color from the Color Line and drop it onto the object, or its outline. And with color gradients, you can drop colors along the gradient path and make multi-color fills. Drag and drop also comes into play when using the galleries. You can place any gallery item on a page simply by drag and drop. Designer Pro also supports drag and drop import of files, such as photos. Xara Designer Pro offers one of the world's first live solid dragging, scaling and rotating of objects, for the ultimate in WYSIWYG editing. That means that as you create, reposition, resize or rotate an object the whole object moves, rather than just an outline, making it far easier to judge the effect of your edits in real time. Completely WYSIWYG drawing! Xara introduced the world's first vector anti-aliasing to bring maximum screen quality. It still pioneers with the fastest, highest quality anti-aliasing available in any drawing program. 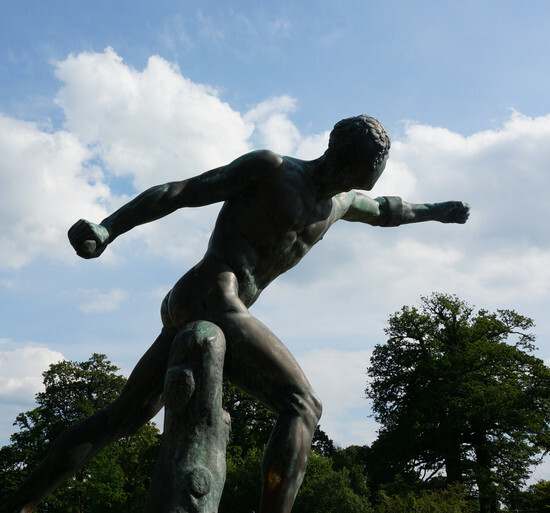 Anti-aliasing improves the quality of on-screen images by smoothing the edges of objects. It does this by blending the edges with the background. This has the effect of smoothing lines and edges and of appearing to improve the resolution of the display. 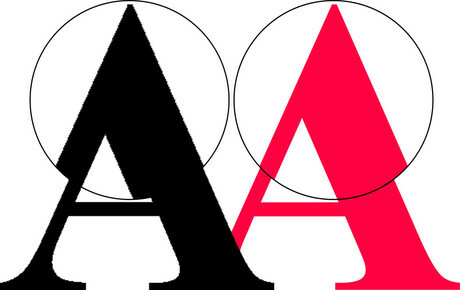 Anti-aliasing is particularly useful for web graphics. When you do use anti-aliasing in Xara Designer Pro, it works in real-time so you can see the effect straight away. You can use anti-aliasing when working with vector images and bitmap images. Xara Cloud offers an ultra-simple way to view, edit and update your Xara document using a web browser on any computer or tablet (yes even a Mac or Android tablet! ), from anywhere in the world. And if it's a website you can re-publish it too. Perfect for collaborative editing, for commercial designers who want to give clients editing access, or for anyone who needs to edit their site remotely. 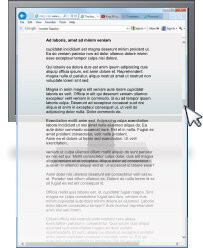 The Zoom Tool allows you to alter the magnification of the current document, giving you a closer, or more distant view. Using the Zoom Tool you can zoom to the whole page, so you see the complete document, you can zoom to the drawing, which magnifies just the drawn image as opposed to the whole page, or you can select an object and then zoom to that selection. Another method is to zoom to a particular area by clicking and dragging the tool over the area. The Xara Designer Pro Zoom Tool is capable of zooming in to 25,601% - that's over 25,000 dpi (dots per inch). Designer Pro can sync files via Dropbox and Google Drive. So if you have the same file open on multiple computers, and you make an edit and save the file on one computer, it will be updated in Designer Pro on the other computers. And there's another bonus: Dropbox and Google Drive maintain older versions of your files, and provide easy ways of viewing and reverting back to earlier versions (in Dropbox simply right click on a file and select 'View previous versions'). This is a safe, easy and storage-saving way of maintaining multiple versions of your files. Xara Designer Pro is used by many different types of customer in a spectacular range of uses - for drawings, text and photos, for print and the web - so we understand how important it is to offer compatibility with other products and users. Designer Pro offers support for a very large range of file formats, making it easy to exchange your work with other users and programs. Xara Designer Pro supports all the common graphics formats, including bitmap types like GIF, JPEG, BMP, PNG, TIFF and PSD, and the import of photos as RAW or JPEG XR (also known as HD Photo format and Windows Media Photo). Plus it supports the key vector types like PDF and AI (Adobe Illustrator)/EPS, EMF (extended metafile) and WMF (Windows metafile), and SVG; early versions of CorelDRAW CDR and CMX and many others that are not so well known. For DTP work Xara Designer supports Word import & export (.docx and .doc), plus you can import and export text in RTF (Rich Text Format) format so it includes style information such as font, font size, color, margins, special and foreign characters (Unicode supported). For presentations Designer Pro can import Open Office Impress .odp and PowerPoint .pptx and export .pptx (beta). If you're working on the web, then Xara Designer Pro also offers integration with Adobe's Dreamweaver and can export HTML pages, and for animation can export Flash, Animated GIF and AVI. Xara Designer Pro offers full support for importing and exporting Adobe Photoshop® PSD files including layer support (Xara objects are mapped to and from Photoshop layers), including alpha channel and 16-bit color and CMYK layer conversion. Adobe Photoshop® is the industry standard bitmap editing solution, and for many professionals Designer Pro is their standard vector graphics tool. Now the two are more closely integrated than ever. Xara Designer Pro has a comprehensive color system which enables you to alter the colors of objects directly or create your own colors, with names, which you can apply to multiple objects. With Xara Designer Pro's unique Linked Colors feature, it is very easy to create a drawing containing many shades of a color and with one alteration, immediately change the color of the whole picture. Simply pick a new master theme color and all linked shades and tones adjust automatically. You can work in CMYK, RGB, HSV, greyscale or Hexadecimal RGB web color mode. There is also a color sampler which, like an eye-dropper, you can use to select the color of any object on the screen, even in other applications, and easily apply it to other objects. Or just drag and drop colors from the color line onto an object to change its colors. The fill tool allows you to quickly and easily apply color graduations to any object, simply be clicking and dragging across the object, so like many features in Xara Designer Pro, color editing is interactive and immediate. For photo work there is also the powerful Color Select tool, which allows you to enhance areas of your photo based on selected colors. Being able to change what you have done is vital in a graphics package. 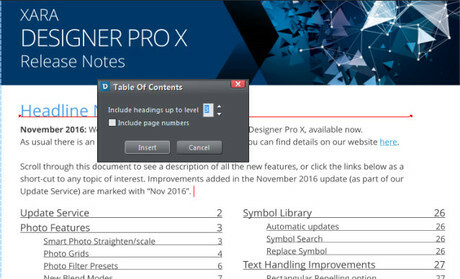 Xara Designer Pro allows you to easily Undo your most recent changes to a document. Undo allows you to get rid of changes which you've applied by mistake, those which went wrong or ones which you simply don't like the look of. Undo is a very powerful tool when combined with Redo because it gives you the freedom to experiment with a drawing, secure in the knowledge that you can always undo any changes or if you eventually decide you do actually like the changes, to redo them again. Some graphics packages only let you undo a limited amount of actions, but Xara Designer Pro has an unlimited undo so it remembers everything you've done. A recent addition to the Online Content Catalog is a range of SmartShape charts, including column and bar chart, pie charts and percentage rings. Instead of complex dialogs, or charting tools, almost all aspects of chart SmartShapes can be adjusted by simply dragging on the control handles, or directly editing the labels and values. 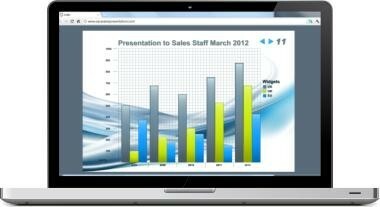 The Content Catalog also includes a large collection of fully customizable interactive column, bar, area, line and pie chart and graph widgets, for website charts. 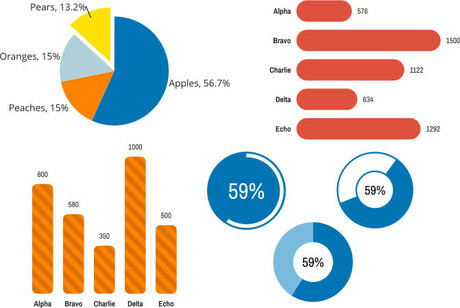 The charts use interactive DHTML and SVG to render the chart in the browser, which responds to mouse-overs to highlight particular chart values. An Online Content Catalog is offered as part of the Update Service and includes a huge selection of fully customizable templates, for print and the web. 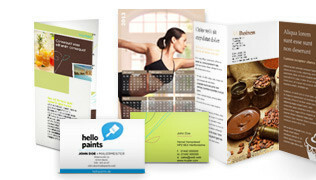 Print templates include cards & invites, stationery sets and brochures, and the web templates include a large selection of web graphic and website templates, and a library of Widgets. Plus the Catalog includes resources of value for any graphic design task including a huge collection of royalty free stock photos from Pixabay and a library of SmartShapes. You can see previews of a selection of the templates here. The Online Content Catalog is updated regularly as part of the Update Service and images can be easily added to your document with a couple of clicks (once you have used an image it also appears in your Local Designs Gallery, which is docked to the side of your document). Xara Designer Pro also includes a font and texture fill gallery including 250 TrueType and PostScript fonts and 500 textures. SmartShapes are an amazingly quick, easy and flexible way to create and edit some of the most commonly required elements on a page, with top quality results guaranteed. The Online Content Catalog (provided as part of the Update Service) includes a selection of 'simple' SmartShapes such as triangles and ovals, but in recent updates we've started to add more complex SmartShapes such as spirals, tables, photo grids, text and photo panels, charts and percentage rings, chevrons and timelines. Each shape incorporates its own editing controls, which makes them totally customizable. Tables are the latest addition to the Online Content Catalog. Xara Tables are SmartShapes, and like all SmartShapes editing is visual and interactive: you can use simple drag and drop to arrange the table, add or remove columns, adjust the width and height of rows and columns or the whole table, re-arrange rows, adjust spacing and cell padding. It's an ultra-flexible table tool. There is a selection of professionally designed ready-made table SmartShapes in the Online Content Catalog (provided as part of the Update Service). Designer Pro offers a quick & easy way to insert symbols from the large and growing Google Material Design and Font Awesome selection. The full set is displayed via the Insert menu, simply browse and click on the symbol you require to insert it in your document as a text character or editable graphic. Designer Pro provides the tools to make it easy to align objects with precision, often a requirement in illustrations but also to give a professional appearance to page layouts. As you would expect you can turn on guidelines and a grid, there is also an alignment dialog where you can align multiple selected objects horizontally, vertically or centrally. Designer Pro also provides a more advanced option in ‘magic’ magnetic object snapping. As you drag an object, it ‘snaps’ to points and lines of interest nearby and indicates what it has snapped to by displaying dynamic snap lines and points. You can even align to lines that are neither vertical or horizontal. This makes it easy to align objects with each other, and/or (at the same time) with guidelines, the grid, the page center or edges. You'll soon wonder how you ever managed without it! Linked stretching is the process of using named objects to stretch or extend other named objects. One of the most common uses for Linked Stretching is when making a web button with text on it, typically for a navigation bar on a web page. It means that when you change the text, the button automatically stretches so the text fits on it perfectly, which means you don't need to spend time redesigning it! But linked stretching can also be a great time saver when you're working on print or web documents - for example you can set up text panels so that they stretch or shrink as you add or delete text. 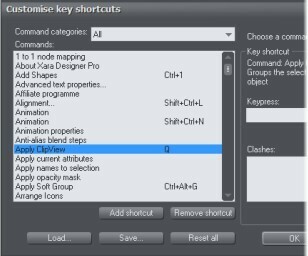 Users can configure the Xara Designer Pro key shortcuts and save / load custom configurations (for example to achieve compatability with another program). Xara Designer Pro has always had by far the highest performing graphics rendering engine, up to ten times faster than Adobe Illustrator. V4 introduced support for multi-core processors in Xara Designer Pro making it even faster than before! Tests show approximate speed gains of 40% for a dual core processor with large screen images, and greater gains with more cores. Large full screen photos can render up to 75% faster on a dual core processor. Designer Pro now takes advantage of the power of 64 bit, if your computer supports it, enabling you to create larger, more content rich documents - for example this is excellent news for anyone creating large websites with lots of high-resolution photos (typically 50 or more) where the memory limits of 32-bit Windows were becoming a problem. With 64-bit Windows you’re no longer limited to the 2 to 3 GB RAM available to the old 32-bit systems. Most current computers are provided with 64-bit Windows and typically have (or can have) more than 4 GBytes of RAM installed. Xara Designer Pro's photo and bitmap handling is amongst the fastest to be found anywhere. 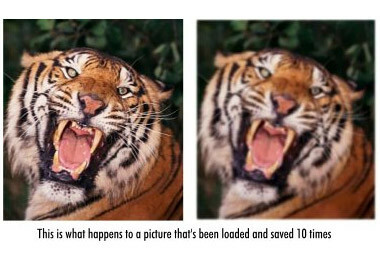 It uses compression techniques that mean that Xara files including photos can be up to ten times smaller than equivalent images in other graphics programs, with enormous benefits for speed and usability. Plus Xara's unique non-destructive editing maintains the high quality of your original photo, however many times you edit it, and gives you the ability to undo any edits you've made to your photo, even after saving and reloading. As a result many people use Xara Designer Pro as their primary, general purpose image composition tool. Almost anything you can do to vector drawings you can also do to photos/bitmaps in Designer Pro. For example, you can edit the shape, alter the transparency, including graduated transparency, use bitmaps as fills on any shape, add a drop shadow, feather the edges and a lot more - all in real-time. Xara Designer Pro also includes a fully integrated, very fast photo editing tool which offers all the common photo editing features such as cropping, rotating, enhancing (brightness, contrast etc), red-eye removal and perspective correction etc with a fast, interactive, live-preview of all edits. Plus it includes an effective photo panorama creator and the innovative content aware scaling and zooming which allows images to be stretched or squashed while retaining the proportions of important parts of the picture. The Color Select controls allow you to alter selected colors in you photo, and then there are the erase tools; 'Magic' Erase and Photo Healing make it easy to seamlessly remove unwanted objects from your photo, and Magnetic Lasso and Background Erase can remove the background so you can place a selected object in your photo on a different background. Xara Designer Pro includes a fast bitmap tracer to help convert bitmaps to vector shapes. Xara Designer Pro also supports third party plug-ins such as Adobe Photoshop plug-ins to expand the range of available effects that you can apply to your photos. 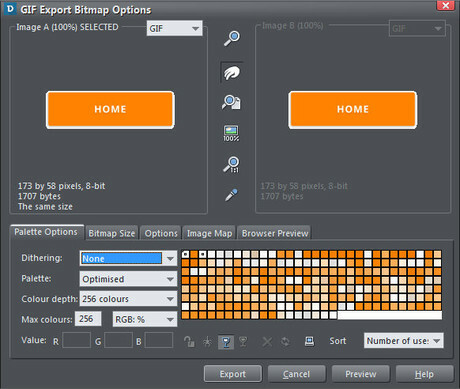 Xara Designer Pro supports all the common bitmap formats, for both import and export. Add to this the ability to handle multi-layer 32-bit alpha channel (semi-transparent) bitmaps and Xara Designer Pro is a supreme image composition tool. Finally Designer Pro includes a collection of professionally designed, fully editable templates that include photo panels, photo grids and photo frames. 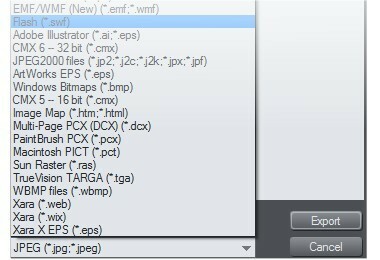 Xara Designer Pro embeds your master JPEG in the Xara file, resulting in huge file size savings. A 5 Megapixel JPEG photo from a digital camera would expand to be typically 20Mbytes in other graphics programs. Use two or three such photos in your image, or make copies to edit and you've now got a file that might easily be 60Mbytes large. The Xara Designer Pro file will be ten times smaller. What's more you can make your files even smaller using Designer Pro's JPEG auto-optimization options, invaluable if you have lots of JPEGs in your document or your website. This plus the amazingly compact nature of Xara Designer Pro’s native file format means that such files are much faster to save and reload. The instant redraw makes working with photos a pleasure, even photos from modern, very high resolution cameras. And this is an added bonus if you are exchanging files via email with other Xara Designer Pro owners. By keeping track of the original master photo and a list of edits performed, Xara Designer Pro offers the seemingly magic ability to undo changes to saved photos. 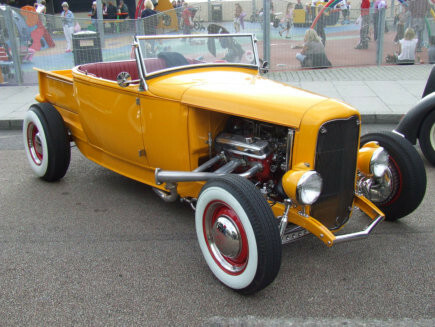 • Now load the cropped version back in and try to Undo or recover the cropped parts. With Xara Designer Pro you can! A fundamental problem with conventional photo editing software is that each time you load and save a JPEG image, it deteriorates slightly. Load and save an image more than a few times and this becomes noticeable. This cumulative distortion is unavoidable if you use JPEG format photos. Xara Designer Pro overcomes this problem by keeping a track of the original 'master' image, much like keeping a photographic negative. When you re-load any JPEG photo saved from Designer Pro, it finds the original master and uses that as the source for all further processing, so Designer Pro's photo editing is 'non-destructive'. It remembers all edits you ever performed to any photo and lets you undo or alter those at any time. 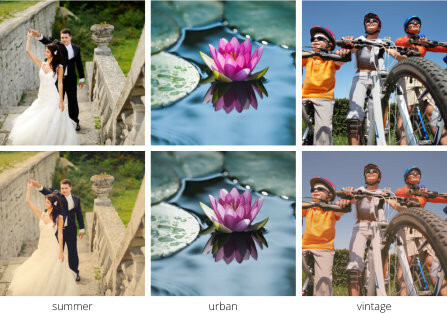 Xara Designer Pro has another trick to help with photo quality - a new bi-cubic photo display that considerably improves the on-screen quality of scaled down photos compared with all other photo software. Simply select the 'very high quality' option on the View Quality slider. Xara Designer Pro includes a fully integrated, ultra-fast, non-destructive photo tool, with instantaneous editing of even the largest digital photos. Features include a fast, live and interactive photo enhance tool for automatically or manually correcting brightness, contrast, temperature and saturation, plus advanced brightness controls in the brightness levels dialog and shadow & highlight controls. There's also an interactive crop tool, photo panorama maker, red-eye removal, a perspective correction tool and the innovative content aware photo scaling and zooming tools. Advanced photo manipulation tools include a Color Select control that enables you to change the color of selecting objects in your photo, new Cross Process effects and the indispensible erase tools, Magic Erase, Photo Healing and Background Erase. The Photo Healing tool is a simple but incredibly effective tool for erasing spots, scratches and blemishes from your photos. It can be used like a paint brush for the Magic Erase feature, so by combining the two you can erase even quite large features from your photo with amazingly seamless results. See some examples of Magic Erase and Photo Healing. In the Magic Erase tool you have the option of drawing a freehand line around the area you want to erase, then one click on the 'magic erase' button and the object is automatically erased and replaced with an appropriate background texture sampled from other parts of the photo. This can often work better than any manual clone and can produce perfectly seamless object erasing, although you also have the option of manual cloning. v365 includes a new Magnetic Lasso for quick and easy cutting out of any object in your photo. Or for images with complex outlines (eg a person's hair) there's the Background Erase tool. The Xara Designer Pro integrated photo tool offers supremely intuitive crop and rotate tools, and Xara’s unique photo handling technology means that it’s real-time, interactive and completely smooth. To crop your photo simply select the Photo Tool, then click and drag over your photo to define the crop area, which can be subsequently repositioned or resized. And you can uncrop a photo later – even after it’s been saved! Rotating a photo is even easier - just click the rotate arrows. Many photographs from digital cameras are under-exposed - too dark. Making individual adjustments of brightness, contrast, and color controls can be both time consuming and a confusing process for a great many users. The integrated photo tool provides an automatic single-click enhance which can instantly improve almost all badly exposed images. 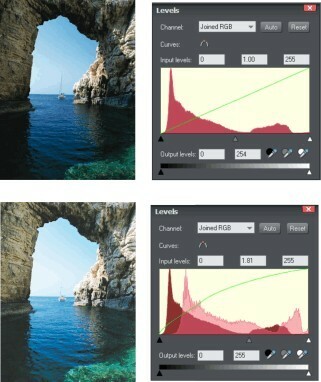 You can also manually adjust the brightness, contrast, sharpness/blur, color saturation, temperature and hue. 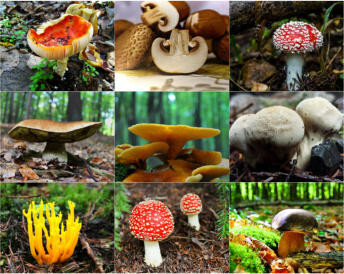 Advanced users can experiment with Cross Process Effects, the Brightness Levels control and Shadow & Highlight controls. A handy Compare button allows you to compare before and after. You can apply any of these photo enhancements to a photo or a selected region of a photo using the Photo Effect Painter and Mask & Region tools. • Control over input black, white and gamma and output black and white levels. These controls provide a far more powerful way of adjusting brightness, contrast and gamma than the traditional simple brightness and contrast controls. • Overlaid before and after histograms. As you adjust the levels you can see the original and the modified histogram (shown in red below). This is a great new option within the Photo Tool that gives you precise control over specific areas of your photo that are in deep shadow or bright light. Simply use the sliders on the InfoBar to lighten/ darken those areas, without affecting the brightness levels of the rest of the photo. 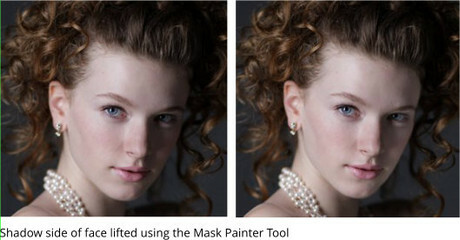 This powerful tool allows you to enhance areas of your photo based on color, using the Photo Tool Enhance operations (such as Brightness, Blur, Hue Adjustment etc). For example you can easily adjust the color of a flower within your photo, or the brightness of the blue sky, without affecting other parts of the picture. As with most operations in Designer Pro this is fast, real-time, and non-destructive in nature (in other words no pixels of the original image are permanently affected and everything can be undone). You can create some dramatic contrast and saturation effects with this new option on the photo enhance toolbar, which simulates a traditional photographic effect created by using the wrong chemicals (digital photo editors like Designer Pro achieve the same effect by manipulating the red, green and blue channels). This is unlike most stock photo & illustration libraries, where you purchase a ‘royalty free’ image, with restricted license terms, often with limited production runs, limited reproduction rights, no re-distribution rights. An increasing number of photographers and illustrators are submitting their work to the public domain, in particular under a license called CC0, which is a very liberal license, totally royalty free, where you can use the image for personal or commercial use with almost no limitation. In conjunction with Pixabay, a website that collects and collates a huge number of high quality CC0 images, we have included stock photo & stock illustration sections in the Online Content Catalog (which is provided as part of the Update Service), where you can search and download hi-res photos and illustrations directly into Designer Pro. It’s a pretty common requirement to want to work on just one part of your photo (or indeed vector image) - for example brightening a selected area of a photo. With the new Photo Effect Painter you can simply 'paint' on photo enhancements such as brightness adjustments, or indeed more complex photo effects combining enhancements and transparency blend modes. The size of the brush and softness of the edge is adjustable, and what’s more you can still edit the values of the effect, or edit the painted region with the Region Painter or Erazer. Applying effects this way is totally non-destructive. Additionally you can draw a selection region to apply effects to with the region tools and / or use the mask tool to protect an area from being altered. The Photo Tool includes innovative intelligent image scaling technology that allows 'content aware scaling', that is images can stretched or squashed while retaining the proportions of important parts of the picture. A new option is 'content aware zooming', which works in a similar way but allows you to resize the object that is the center of interest without increasing the size of the total image. Using the integrated photo tool in Xara Designer you can easily create panorama pictures. The integrated panorama picture assistant helps you seamlessly attach the individual pictures of your panorama-to-be to one another. Simply import your pictures, optimize the picture transitions, and you're done. 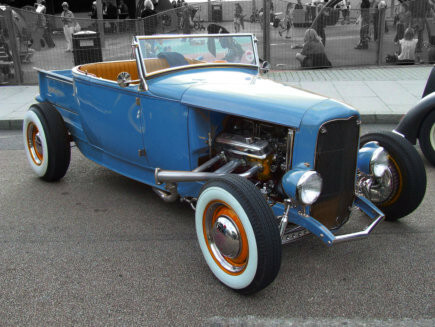 In just a few clicks you can turn your individual pictures into tailor-made panorama pictures. Create web based 360 degree panoramas, perfect for showing off your restaurant interior and that type of thing. The Perspective Correction tool offers a simple one-click way to automatically correct common perspective effects. Here's some examples, it looks like the buildings are being straightened! Xara Designer Pro supports Adobe Photoshop plug-ins. There's already a huge range of such plug-ins available, both free and commercial, for creating a variety of effects that would take a lifetime to explore - metallic effects, color and image distortions, glows, water ripples, crumples etc etc. These plug-ins can be used with both bitmaps and vector drawn images - check out the Live Effects tool. We have bundled a selection of the best plug-ins with Xara Designer, including examples from Redfield and Mehdi, plus plug-ins from MAGIX making more than 60 plug-ins in total. Photo Filter pre-sets are a wonderfully quick and easy way to apply popular effects to your photos, such as cold, summer, vintage or exposed. You’ll find 125 ready-made effects in the Online Content Catalog (provided as part of the Update Service). Simply select your photo and hit Import. What’s more you can continue to edit the effects using the Enhance tool or Brightness Levels dialog, and if you replace the photo the effects are retained. One of the most common requirements for anyone working with photos is red eye removal. The photo tool in Xara Designer Pro offers an integrated, intuitive red eye removal tool that is fast and simple. You can import RAW digital camera files (either using the Import menu option or just drag and drop the file onto the Xara Designer Pro window). Xara Designer Pro’s powerful bitmap tracer can convert your bitmaps – typically photos, line-art or logos – into editable vector shapes. 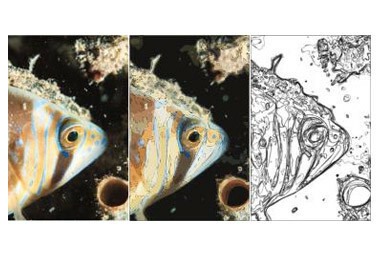 The Tracer offers great flexibility, with control over the number of colors, the fidelity of the trace to the original and a useful ‘noise’ cleaner that can remove imperfections from your bitmap (for example caused by scanning photos). So if for example you need to edit your logo and all if you have is a bitmap, all is not lost! 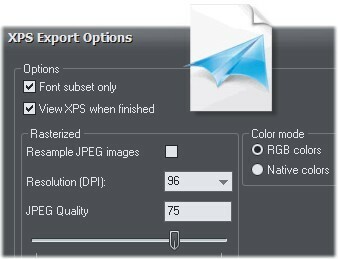 Designer Pro includes the option to display an EXIF dialog, semi transparent and configurable, which shows the embedded EXIF values of your JPEG photo. Xara Designer Pro's integrated photo tool offers all the essential photo editing and enhancement features that you're likely to need. However Designer Pro also offers the ability to select an external photo editor if you wish. What's more, Designer Pro monitors the photo file being edited, and detects when it's updated by the photo editor and then re-imports it back into Designer Pro - and that means you can continue to have your photo editor open while working on the document in Designer Pro. So whenever the image file is updated in your photo editor (when you click Save) your Designer Pro image is updated showing you the updated picture in context. Xara Designer Pro originally made its name as a supreme illustration tool and still maintains its popularity among illustrators, as you can see from some of the awesome illustration work on display in the Xara Gallery. The key to its popularity is its speed, ease of use, uncluttered user interface and the intuitive design of its drawing and design tools. For example the interactive nature of the direct action tools, the use of drag & drop and solid object drawing and dragging all make experimentation both quick and easy. 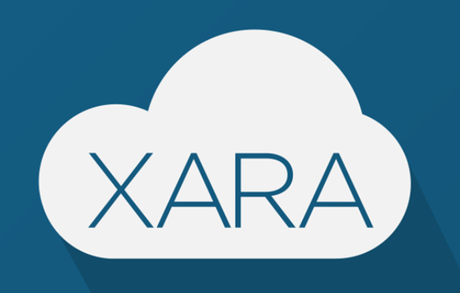 Xara was a pioneer of vector transparency and still offers unique advantages such as graduated transparency, the new Enhance transparency type and Opacity (transparency) masks. Many of the other individual tools remain best of class, for example shadow, feather, fill, blend and 3D extrude. Other innovations include the Live Effects tool. There have also been recent significant advances in the pressure support (Xara's pressure profile controls are particulary powerful). The extrusion tool in Xara Designer Pro uses the 3D rendering technology developed for Xara's popular Xara 3D Maker tool, to bring high quality 3D extrusion capabilities to Xara Designer Pro. It provides a fast, easy way of creating simple 3D shapes from any 2D shape or outline, rendered with high quality shading and light reflections. Creating 3D images couldn't be simpler: on screen dragging allows real time 3D object rotation, dragging of the extrusion depth, and adjustment of the lights in 3D space around the object. Xara Designer Pro uses two types of drawing tools: Freehand tools and Shape tools. The Freehand tools allow you to hand-draw lines or shapes on the page. You can simply drag on the drawn lines to convert them into curves, or 'push' and 'pull' them in a very intuitive way. You can choose in advance how closely you want the computer to follow your movements, or you can smooth out any minor bumps with Xara Designer Pro's retroactive smoothing. You can even draw one shape, then add another bit to it by drawing some more and joining up with the original object. Plus there's an extra straight line tool giving a really quick and easy way to create single-segment lines, with easy arrowhead and tail control. 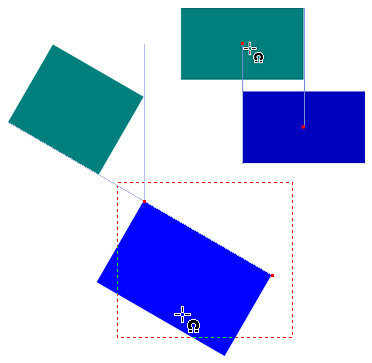 QuickShape tools allow you to draw basic pre-set shapes very quickly, such as rectangles, circles/ellipses. The more advanced SmartShapes offer a quick and easy way to create and edit more complex but commonly used shapes such as speech bubbles and arrows. The new Shape Painter and Shape Eraser tools provide another really quick and simple way of drawing, editing and erasing lines and shapes, with a paintbrush style action. Any object you create, either Freehand or Shape, can be resized or rotated by simply dragging its handles. Designer Pro offers solid live line and shape drawing (instead of outlines) so you can see exactly what your shape and line will look like as you draw it. Any object you create (including text and photos) can be made transparent using the wide variety of transparency options. Like real-time anti-aliasing, Xara was the pioneer of vector transparency. Transparency can be used in a number of ways - one of the most common is to simulate glass, but it can also be used to create subtle reflections and highlights that are very difficult to achieve in any other way. Another common use is to overlay parts of your drawing with additional transparent objects which can then be used as filters to modify colors or contrast in your image, for example. Xara Designer Pro also allows you to create textured transparencies by using bitmaps of your choice to give a special effect to any graphic or selection of graphics. Transparency can be applied in a linear graduation or even a multi-stage graduation. Plus there's a variety of shapes such as diamond or conical transparency to get some very unusual effects, you can even apply irregular custom shaped transparency using Opacity Masks. Another innovation is Enhance Transparency that allows you to create transparent 'floating' shapes which enhance the brightness, contrast and/or saturation of the objects underneath them. Transparency can be applied in any direction and is independent of color - simply select the transparency tool and then click and drag on the image to apply the transparency, completely interactive and immediate. The Xara Designer Pro Blend Tool allows you to blend or merge between any two objects. These objects can be any of the available object types (text, bitmaps, shapes), or even other blends. Using the tool creates a set of intermediate objects so you get a transition from the start object to the end object. You can change the number of steps in the blend and also have more than one stage so you can blend between several objects. Blends can be used to create complex highlights, blurred edges on objects, repetitive patterns and many other effects. You can even edit objects within the blend once you have created them. You can also set blends along a path, such as a curve. For fine tuning, blends also have a profile control for adjusting the rate of change of steps and other attributes across the blend. Xara Designer Pro performs blending in a very quick and memory-efficient way compared to other drawing packages - meaning less waiting for you and less draining of your systems resources. Soft vectors or 'feathering' is a technique of slightly blurring the edges of objects to help them blend into the background - until recently impossible in vector drawing programs. Simply by selecting an object - any object including shapes, text, photos and even clipviews - and moving the slider on the feather bar, it makes the selected object merge into background objects and avoids a sharp line at the boundary. This is particularly useful when overlaying bitmaps. Xara Designer Pro allows you to change the feathering profile, altering the transition across the feather. You might want a regular rate of change or a more pronounced change towards one end or the center. Note that feathering affects only the object's edge and no other part of the object. Creating realistic shadows has commonly been the realm of the bitmap graphics package. Xara Designer Pro's Shadow Tool changes all that and lets you apply, remove, and modify semi-transparent (or 'soft') shadows to any object, with a single click. The transparency of soft shadows increases towards the edge, which gives a very realistic effect. Shadows in Xara Designer Pro are not bitmaps but remain vectors, the benefit is they are resolution independent, which means you can scale them without losing quality. There are three different shadow types to choose from - Wall, Floor and Glow. Wall shading produces drop shadow effects, the Floor option works like a sundial would and Glow creates a halo effect around an object. Any shadow you make can be manipulated in a number of ways, allowing you to change the color, blur, transparency and profile. Again, the Shadow tool takes advantage of the direct action feature. Bevels give objects the appearance of depth instead of being flat on the page. 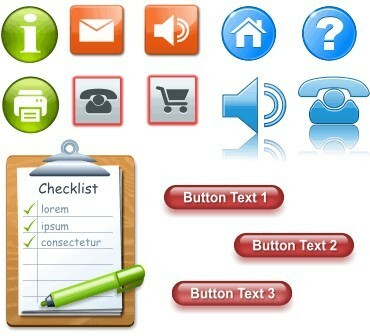 They are particularly useful when creating buttons or headings for web pages. The Xara Designer Pro Bevel Tool allows you to quickly apply customized bevels to any object you draw. There are a range of set bevel types to choose from, such as flat, frame and rounded, and each one can be altered to make it unique. You can alter the depth, contrast and lighting elevation (unique to Xara Designer) and angle, and you can choose whether the bevel should be inside or outside the object. Xara Designer Pro also allows you to treat a bevel like you would any other object in a document - so you can apply transparencies, color bitmap fills and so on. And again, the Bevel Tool takes advantage of Xara Designer Pro's direct action feature. Bevels in Xara Designer Pro are resolution independent, which means you can scale them without any loss of quality. Creating contours around objects is easy with the Xara Designer Pro Contour Tool. Contouring is a special effect which adds evenly-spaced concentric rings inside or outside an object. These rings can be made to fade in to the background, or progress through a rainbow of colors. When you have applied a contour to an object, if you resize or alter the object, the contour changes with it. The contour itself can be edited and you can change any of its properties, including the distance between the steps, the number of steps, contour width and profile. The Inset Path button lets you convert your contoured object into a larger or smaller shape, removing the actual contours. This gives you more flexibility than simply resizing an object, as it deals with thickness as opposed to size. You can fill an object with a color or multiple colors, or even with a photo, bitmap or fractal effect. Xara Designer Pro offers a wide range of fill types - flat, linear, circular, conical, elliptical, diamond and three and four color fills. You can apply fills to Quickshapes, shapes and even text. If you apply a fill to a compound object (a blend, mold or group) it affects all the objects in it. Once you have applied a color fill to an object you can change its size, position, direction and the colors it uses as well as the way the colors change across the fill. With bitmap fills you can change the bitmap used and with fractal fills you can change the resolution and grain of the fractal. One of the strongest features of Xara Designer Pro is the simple and interactive way that color fills can be applied and edited. Just drag a color from the color line and drop it onto the object you want to fill, then drag the fill arrow to adjust the position and angle of the fill or drop new colors onto the arrow to create a multi-stage fill. This direct action makes working with fills much easier than any other graphics program. Live Effects are plug-in effects that can be applied to any object, including vector drawings. They are called Live Effects because the vector object remains editable after applying the effect - when you edit the object, the Live Effect is re-applied automatically to the new shape. Adobe Photoshop® plug-ins, both free and commercial, already exist for creating a range of effects that would take a lifetime to explore - metallic effects, color and image distortions, glows, water ripples, bevels etc etc. We have included a selection of the best Photoshop plug-ins that work as Live Effects in Xara Designer Pro. Molds allow you to distort any object you select according to a set shape - rather like a jello mold does. There are two types of mold - Perspective Molds and Envelope Molds. Perspective Molds are ideal for creating banners and three-dimensional effects. 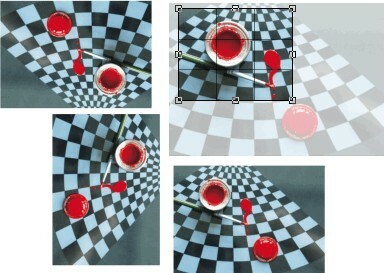 They distort an object by making it appear to have perspective. With Envelope Molds you can have curved sides and you can distort and warp a shape using the four corners of the mold shape. Molds and Envelopes can be applied to shapes, bitmaps and text, and all objects remain editable. Xara Designer Pro has several ways of using objects to "mask" or "clip" other objects. You then see part of the objects through that mask. ClipView is one of these methods, but it is different from the others because it is dynamic. It lets you use an object as a 'window' onto other objects. You see only those parts of other objects that are within the window. We call this creating a ClipView. You can move the window object to change your view while the window object remains visible. The real-time brush feature of the Freehand and Brush Tool is a fun but extremely powerful feature. It enables you to create any shape, then use it to 'draw' with, giving endless possibilities. Designer Pro offers both Scatter Brushes and Art Brushes. Scatter Brushes repeat shapes along a line and you can create them using any type of object (so for example you could include feathering or extrusions). What's more you have complete control over how the brush paints to screen - you can alter the size of instances, color, spacing, rotation and offset properties, and each of these has a randomize option which can give a less ordered look. On the other hand Art Brushes stretch a vector shape or bitmap along the line (like these textured acrylic brush strokes, left). When using brushes, you can also take advantage of Xara's pressure sensitive feature by setting the brush to adjust the scaling or transparency of brush strokes according to how hard you press with your graphic pen. Each brush you create is saved along with the document it's used in, so you can re-use them whenever you wish. The closest thing to actually drawing for real comes from using a graphics tablet. 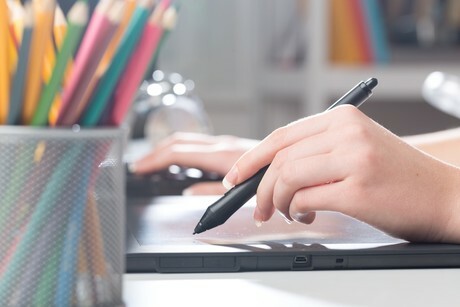 With Xara Designer Pro using a graphics tablet can be even more realistic if you take advantage of the pressure sensitivity feature in the Brush tool. The Brush tool gives you the option of relating the size and/or the transparency of the brush stroke to the pressure applied to the pen. You can choose whether you want the pressure to affect scaling or transparency - or both, or neither. 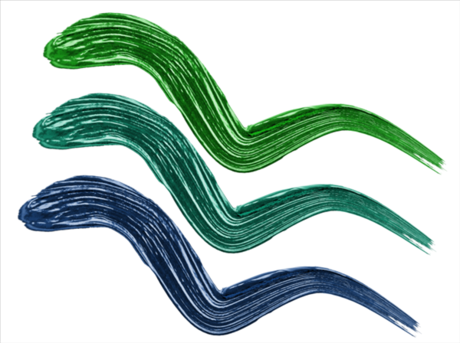 You can use the shape painter tool to create lines and shapes in a 'paintbrush' style way. You can also ‘paint’ onto an existing shape to enlarge it, add new areas or adjust the shape or outline. It does this in a vector way, and is a more direct and often easier way than using the Shape tool. You can adjust the size of the ‘brush’ as well as its aspect ratio and rotation angle. The Shape Painter Info Bar provides controls over brush size, the roundness, brush tip angle and the softness, as well as a smoothness control which adjusts how accurately the brush stroke follows your mouse movement. 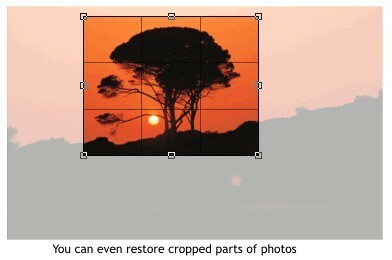 Note: This tool can be used on photos, but it’s only useful to enlarge an already edited or cropped photo outline. This is really two powerful tools in one, and can be used to perform hard-edged vector erasing of shapes and photos, or soft erasing. Hard Erase: When used with a hard edge, it’s a fast and direct way of adjusting the vector outline of a shape inwards. If you stroke around the edge of a shape, it just moves the outline inwards. Dragging a hard-edge erase stroke completely across an object will cut it in two and create two separate objects. If you click and hold, it will simply cut a hole in the shape. Soft Erase: Strokes over any object will erase, ie make transparent, the brush-stroked area. The softness control adjusts how soft the edge of the brush stroke is. One of the great things about this soft erase feature is that it’s not destructive, it doesn’t change the underlying erased shape or photo at all (unlike most other photo editing programs) - so you can change you mind and adjust the erase or un-erase. What’s more you can, for example, apply a soft erase across some text, or perhaps a 3D extruded shape, and then still edit that text, or adjust the 3D extrude, after the erase has been applied. When adding a blend, transparency, contour, fill or shadow to an object, you can change the attributes or properties of the effect by using the Profile dialog box. What the Profile dialog box actually allows you to do depends on which effect is being used, but in all cases, you can either choose one of the set profiles or use the sliders to create your own. With transparency and fills you can change the rate or shape of change from start to end, while with blends and contours you can alter how the steps are spaced and how attributes like the colors, line thickness and transparencies are used. With shadows you can change the rate of change of transparency across shadow. It's all about giving you that extra little bit of control over your effects that can make all the difference. Altogether, the Profile dialog box makes a very powerful tool to help get your graphics just right. A powerful feature and a great time saver - Live Copies are multiple instances of an object in a document, that all update instantly and automatically when one of them is edited (sometimes called ‘live clone’). Opacity Masks provide an innovative and powerful way of applying transparency. Sometimes you need a more advanced transparency ‘shape’ than simple flat or graduated transparency can provide, for example if you wanted to apply a soft variable transparency around a central object in a photo - like the example on the left. Opacity masks are a way of defining irregular transparency shapes based on a drawn object or group of objects. The Selector Tool InfoBar includes a field displaying the perimeter length of any selected closed shape or the line length of a selected line, and the area of any closed shape. It's particularly useful for plans where you have set up accurate unit scaling, meaning you could for example read the exact floor area in square feet or meters. Xara Designer Pro has long been a popular choice for creating web graphics. High quality anti-aliasing, flexible transparency support, a comprehensive set of drawing tools, the ease with which you can mix photos, drawings and text, and simple image map creation all make Designer Pro a good choice for creating web graphics. Designer Pro supports all the web bitmap formats including GIF, JPEG and PNG (including alpha channel) plus it offers full manual optimization at export ensuring the best quality and file size. Xara Designer Pro also offers one of the easiest ways to create really efficient Flash animations (and it can produce animated GIFs too). You can create your own designs from scratch in Designer Pro, or you can customize the professionally designed templates - Pro comes with a selection of ready made web graphic templates, webpage and website templates, presentation templates and a Widget Library. You can see an example site created in Xara Designer Pro at webdesigner.xara.com (it's also an introduction to using Web Designer). 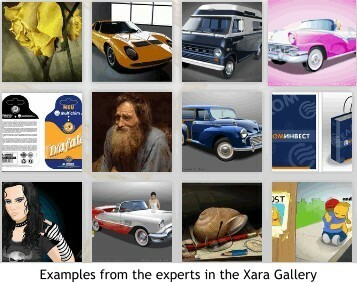 Plus check out these sites created by Xara users in the Xara Website Gallery. (Note Designer Pro includes all the features and templates of Xara Web Designer Premium). With Xara Designer Pro you can easily create HTML web pages and websites in a totally WYSIWYG fashion - absolutely no HTML skills required. And we mean state of the art websites; CSS3/HTML5 compatible, responsive (with for example variants for mobile or tablets), presented as single scrolling pages or with transitions between pages (see Supersites), incorporating multimedia content, social media, and even with auto image optimization for Retina - all without you having to understand these technologies or get involved in coding. The advantage of using Designer Pro to create web pages is that you get complete freedom to layout your page in a typical DTP fashion, with easy drag & drop editing. You can position items anywhere on the page, include as many graphics as you like (even semi-transparent graphics) with text - even rotated text - wherever you like! And Xara Designer Pro will create all the HTML for you. Some of the great features that make Designer Pro a first class web authoring tool include easy creation of NavBars with DHTML menus, mouseover and pop-up effects, text flow around photos, single click browser preview, flexible handling of page backgrounds, and easy one-click site wide color changes. 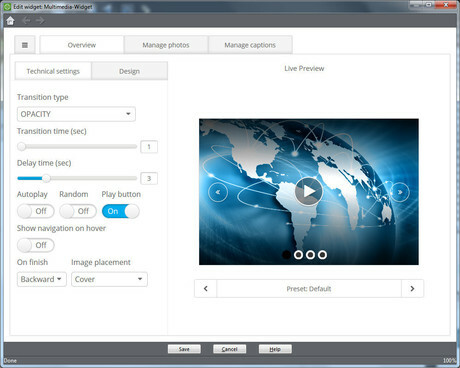 Other significant features include support for third party 'widgets', easy drag and drop addition of videos, and support for online presentations. Two valuable recent additions are smart page resize and font embedding. Sites can be uploaded to your web host via ftp, or we include a free hosting deal, with a super-easy publish option. We also offer Xara Cloud as an optional extra, which gives you the ability to edit the text and images of your website remotely in the browser, from anywhere and any device! An as you would expect, Designer Pro produces cross browser, cross platform compatible, fully standards compliant (X)HTML. We have also invested significant effort to ensure all our templates and features are ready for mobile devices so you can be sure that your site will work when viewed in the latest iOS and Android smartphones and tablets. Here are some example presentation templates and you can see an example presentation here. These are objects that you can 'stick' in place as the page scrolls underneath. A good example is the NavBar which you can stick to the top of the page as viewers scroll down, so they can still easily navigate to other pages without having to scroll back up to the top. In Designer Pro any object can be stuck to any position on the page. Website designs with no obvious page boundary are now very popular, and in these sort of designs you'll commonly see a page background that covers the entire browser window and stretches to fill the browser width. In Designer Pro you can make any rectangle or image stretch to fill the browser window, either horizontally or vertically. Designer Pro is a great solution for creating web pages and even complete websites. 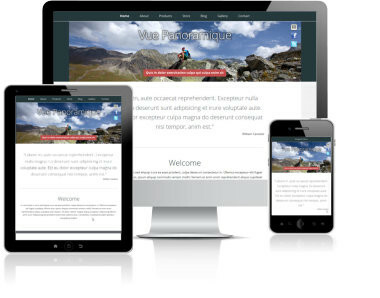 It's possible to create your own site design from scratch but we also include more than 250 website templates in the Online Content Catalog (provided as part of the Update Service) - including over 100 business specific themes - that can be customized in all respects to your particlar requirement. The web themes include up to 15 page layouts plus a wide range of matching components such as buttons, headings and icon. 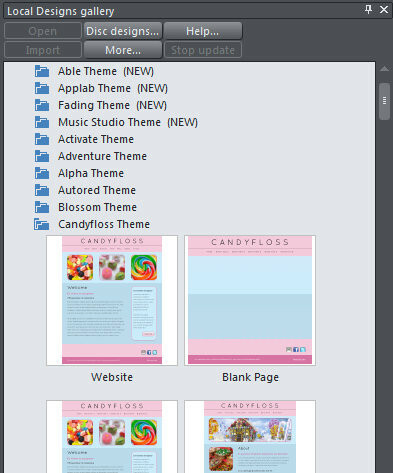 The colors can be easily changed because the theme colors use our unique Linked Colors feature, but to make things even easier the Online Content Catalog includes several different color versions of each theme, ready made! You can see previews of some of the website themes here. The Online Content Catalog (provided as part of the Update Service) includes a large selection of professionally designed, fully cutomizable web graphics such as buttons, NavBars and icons which can be added to your document and easily changed to match your site. 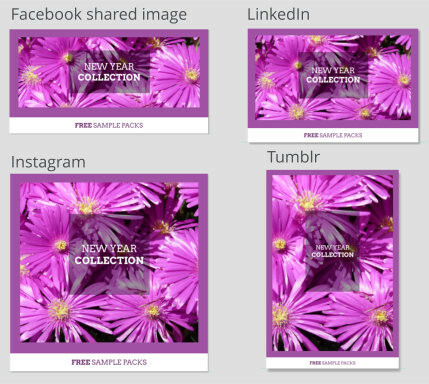 New additions are constantly added to the Online Content Catalog, the latest examples include a set of social media templates such as covers for Facebook, Twitter and G+. You can see previews of some of the web templates here. The color, text and size of the graphic templates are completely customizable without any loss of quality (because they are vector) and especially benefit from the Linked Colors and Linked Stretching features, and it's easy to add mouseover effects. They can be exported in any of the common web formats such as GIF, JPEG or PNG. 'Widgets' is a collective term used to describe a third party service which can be inserted into your web page. Examples include Google Maps, YouTube movies, forms, news feeds, and many, many more. Designer Pro includes a large collection of the most popular and useful Widgets in the Online Content Catalog (provided as part of the Update Service), including popular photo slideshow widgets (you can see previews here) and e-commerce solutions. Other popular bundled widgets include social media (including Twitter and Google+), Google AdSense, Google Maps, YouTube movies and an 'embed a website' widget. It's easy to add widgets to a website created in Xara Designer Pro, simply select them from the collection in the Online Content Catalog and then customize them to your particular requirement. Our handy Widget Guide offers step by step instructions for many of the most popular bundled widgets. 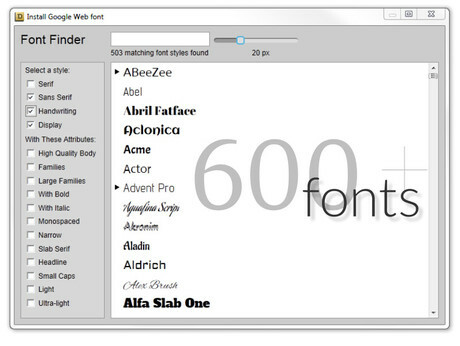 Designer Pro's font embedding technology overcomes the serious design limitation of having to stick to the very small selection of so called ‘web safe’ fonts. Our technique is compatible with the vast majority of modern web browsers and works by embedding a special version of the font on your website which the web browser can download and display. The main benefit of using an embedded font (as opposed to turning text to graphics), is that search engines can see and index this text. Plus visitors to your page can also select and copy this text, like any normal text. This feature provides a considerably enhanced degree of design freedom for web designers. In most web page designers you have to manually adjust the position of items on your page as you add or delete objects or text on the page. Similarly you have to manually adjust the size of your page as your content grows. Not in Designer Pro! Pro has the ability to make growing text areas automatically push other objects down the page, and also lengthen the page automatically to accommodate the enlarged text areas. And the feature works in reverse, automatically adjusting the position of objects and shortening the page when you delete text or objects on the page. It's a huge time saver! Buttons and navigation bars are an essential part of most web sites, but making them can be a time-consuming and frustrating experience. Xara Designer Pro allows you to create standalone buttons or fully functional navigation bars within minutes including rollover effects - and Designer Pro will write all the code for you. Simply create your own single button design or select one of the button templates in the Online Content Catalog (provided as part of the Update Service) and then with a few clicks you can turn it into a horizontal or vertical NavBar with rollovers. 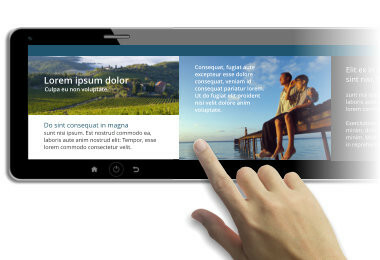 The intelligent automatic button stretching even automatically adjusts the button width as you enter text. Recent updates to the NavBar feature include support for DHMTL sub menus with various animation and transparency effects, the ability to create an automatic NavBar with buttons linked to all pages of your website (the NavBar is updated as you add / remove pages), auto-highlighting of 'current page' NavBar button and the ability to change your NavBar design by simply dropping a new design from the Designs Gallery onto your existing bar. 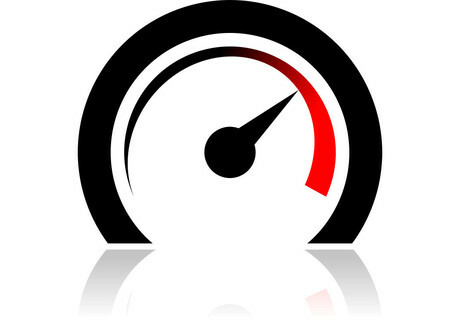 Optimization of web graphics is an essential factor if you want to keep fast download times for your web pages. This means that you can choose the exact settings you want, including: color depth, dithering and transparency. You can also lock specific colors to make sure they are retained within the image. You can preview every change you make so you can see what the result will be before committing yourself and in the Export Dialog you can compare different export options so you know which one is best. Xara Designer Pro includes 'Website M' hosting free for 12 months. 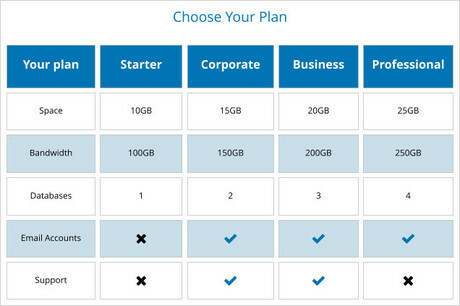 M Hosting offers 2 GB of webspace, plus a free top level domain. 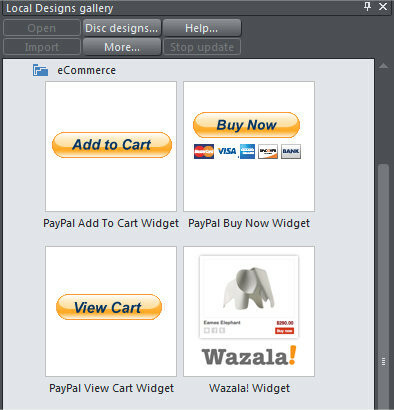 Designer Pro offers full support for third party widgets that can be simply dropped onto a page as you design it. The Designs Gallery includes a large collection of Widgets including a selection of the most popular and trusted e-commerce solutions. Drag the Widgets from the Designs Gallery and drop them onto your page, then customize them as required for your particular use. The current bundled e-commerce widgets include solutions from Paypal, Wazala, Google, ecwid and Amazon. It's easy to create pop-ups for your photos, and you have advanced controls including an optional soft shadow, title and captions and page dimming (the page under the pop-up can be dimmed). If you have a number of thumbnail photos with the pop-up effect on the page, you can show this as a slideshow, with Next / Previous / Play / Pause controls and an optional thumbnail strip shown at the bottom of the window. We also include a very flexible slideshow widget in the Online Content Catalog (provided as part of the Update Service) that enables you to set up a photo slideshow with complete control over transitions, captions etc. 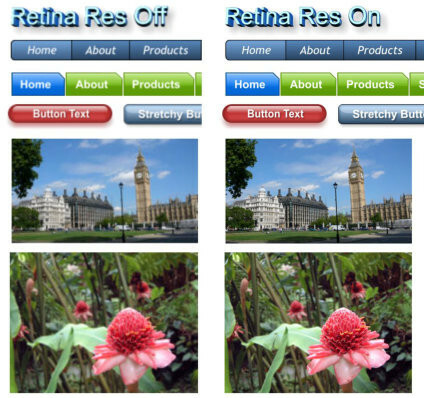 Most of the latest versions of iOS and Android devices support superb quality Retina® graphics. Designer Pro automatically creates the high-resolution photos and web graphics required for Retina displays - you need do nothing - but the web pages are smart and only load the correct resolution graphics for the browser being used. Any static image you create in Xara Designer Pro can be exported in .swf format, which can then be imported into a Flash movie and animated. Because the graphic is in the Flash format, it remains scalable, so you can resize it and manipulate it within Flash without losing any quality. However Xara Designer Pro is also one of the easiest ways to create your own really efficient Flash animations. Flash tools have a reputation for being unintuitive, difficult to master and over complex, and as a result Flash has been restricted to those willing to dedicate substantial time to mastering them. On the other hand, the Designer Pro drawing tools have the reputation of being extremely easy to learn. So we have been able to bring the ease of Designer Pro to Flash animations. 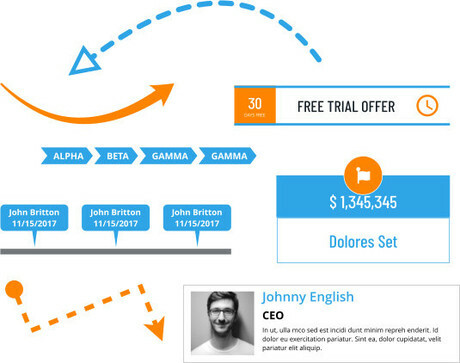 Designer Pro's Flash animation doesn't use complex time-lines. Instead it's more like traditional animator's art, where you produce snap-shots or key frames of your animations at points in time. Designer Pro automatically produces in-between frames to create smooth, really compact Flash animations. Note: Designer Pro Flash animation does not support complex advanced features such as scripting, sound or embedded movies. Instead it's Flash animation for the rest of us, perfect for creating banner ads, text and photo effects. Animated gifs are still a common form of animation used on the web. Used for banner advertisements, spinning buttons and character animation, animated gifs will be around for a while yet. The Xara Designer Pro Frame Gallery allows you to create animations one frame at a time. It gives you complete control over every aspect of the animation from pauses between frames to the transparency of objects. When exporting, Xara Designer Pro is able to fully optimize animated gifs so they have as small a file size as possible, meaning you can create eye-catching animations without hindering the performance of your site. Designer Pro offers several ways of displaying your photos to the world. 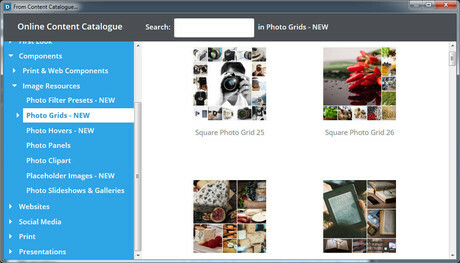 The Onlnie Content Catalog (provided as part of the Update Service) includes a selection of eye catching photo slideshow and photo gallery widgets. You can see previews of our photo widgets here, they include several conventional layout galleries with optional slideshows, plus a wide selection of more inventive displays. Photo Grids are a cool new addition. The Smart Photo Grids let you display any collection of photos, even those with different shapes and aspect ratios, in a compact grid on your website. Drag and drop your photo onto the grid and it automatically updates to fit your photo in, no matter what shape it is! Most of the Web Themes include a Photo Gallery page layout, with pop-ups, slideshows or photo grids already set up. Adding your photos couldn't be easier, simply select your photo and drag & drop it onto the photo in the template. And of course all the photo tools such as auto-enhance and red-eye correction can be used to edit your photos individually. 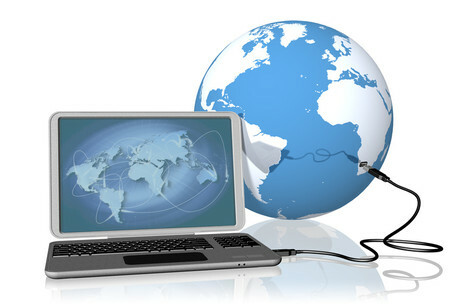 Image maps are used in web pages to create clickable areas or hotspots on a graphic. For example, if you had a map of the United Kingdom - as shown in the example - you can use an image map with a hotspot over each country. Xara Designer Pro allows you to assign a web address to any object in a document. You can then export the complete image along with the necessary HTML required to make the image map work. When assigning a web address to an object you have the option to make the hotspot fit the object exactly or roughly outline the area with a rectangle which can produce much less code than a complex shape. You also get the option to select where the link should point to - to a new window, the current frame, the parent frame and so on. Being able to select colors based on their hexadecimal value is vital for web designers. That way you can match your graphics with colors from the standard web safe color palette, that you use on your web page. Often a designer will want to match a graphic color with the background color placed in a cell of a table for example. As HTML uses hexadecimal values (eg. #CCCCFF) to represent colors, it is extremely useful to be able to specify these colors within a drawing package. 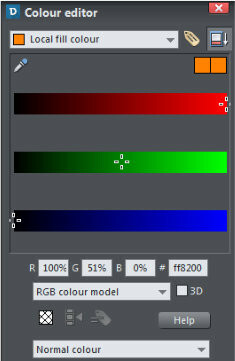 Especially for web designers, Xara Designer Pro has a Hexadecimal RGB Web Color option which allows just this. 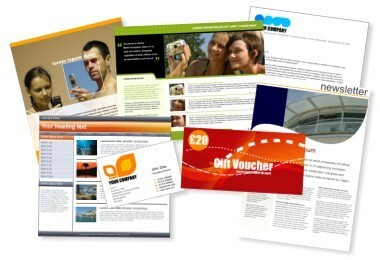 Designer Pro is a great choice for all your DTP and document creation needs. It combines all the text handling and page layout features of typical word processor and DTP packages with the image editing power of our illustration and photo editing tools, based on decades of experience creating graphic design products. The result is a fully integrated, flexible and powerful 'Document Processor' that you can use to create all the documents you need for your business or personal use. Designer Pro offers everything you need for manipulating text. Like any word processing program, you have full control over the text style and format - you can change the font, size, color and justification of the text, alter the line spacing, tracking and kerning, and have bold, italic, superscript, subscript or strikethrough. You can set margins, tabs, indents and outdents, and easily create bulleted or numbered lists (with your own custom bullets and numbers if you wish). 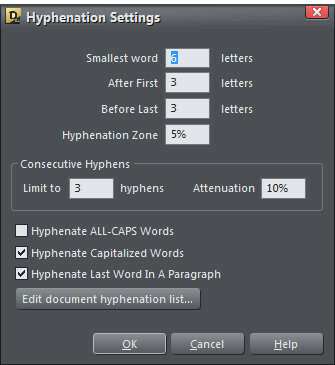 And there are advanced options such as auto-hyphenation and Open Type ligature support. Text can be entered as stand alone single words or lines at any place in the document, or in single or multiple columns with advanced text flow controls between the columns, and with formatting controls such as column and page breaks. 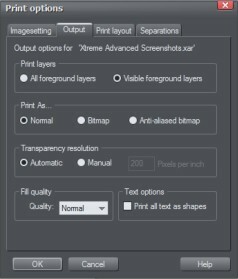 And there's an added bonus; Xara's industry leading screen rendering makes the on-screen text a more accurate representation of the final print result, especially at small sizes or rotated. Designer Pro is great for single page designs such as business cards or adverts, but it can also handle more complex multi-column, multi-page documents with ease, with automatic text flow onto new pages, automatic page numbering, single page or cross-document control of headers & footers, and very flexible controls over text flow between columns. With multi-column layouts you can switch column count and customize columns individually, have a common multi-column layout throughout the document or individually designed pages. And you can have single page or seamless double page spreads supporting across-the-spread graphics. Designer Pro's ultra-fast rendering means you can scroll through pages quickly and smoothly, even on large documents. And the pages are easy to manage via the Page and Layer Gallery where you can re-order, add or delete pages in your document. 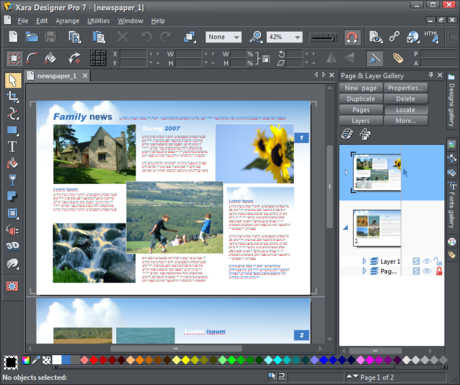 In Designer Pro, multi-page documents can also be used in combination with the Website creation features to produce multi-page websites and presentations. Designer Pro supports Text Styles, a powerful way to alter the appearance of text throughout your document with just a few clicks. Update an element of your Text Style eg font, color, line spacing etc, and all text with that Style applied throughout your document is instantly updated – headings, titles or body text. Consistent text styles help you create professional looking documents, and with Designer Pro it couldn’t be easier. What’s more we offer ‘live’ Style preview; Simply select some text and then traverse the Style menu - the selection will change to show your text in each Style. It’s a quick and easy way to try out your Styles without having to actually select and undo each in turn. You can force text to automatically flow around any object (illustration, photo or whatever) by simply right clicking on the object and selecting 'Repel text under'. The repel margin can be altered if required. As you'd expect Xara provides super-fast text re-formatting allowing live and interactive text flow as you drag the objects around in the text. So, no more time consuming manual reformatting when you decide to move an irregular shaped object in your document - it's a huge time saver and makes experimentation easy! With Designer Pro it's easy to fit text inside shapes, so that it flows within the shape’s outline. In fact you can add text to any type of object, even groups, to create some original and attention catching visual effects. You can build a Table of Contents automatically and insert it at the caret position, a massive time saver for anyone creating a long document. Normally this is a pretty time consuming, manual process. Designer Pro now includes a powerful new tool that will analyse a photo, identify the pre-dominant colors in that image, and create a color palette of those colors with the names Theme Color 1 to Theme Color 5. By using those Theme Colors in your document, and linked shades of those colors, you can quickly and easily give your design a harmonious, professional look. Here's an example of just how effective this feature can be - the same text and layout with different photos, with theme colors based on the photo. Many modern OpenType fonts include typographical ligatures, which allow pairs or sequences of consecutive characters in text to be displayed with a single glyph. 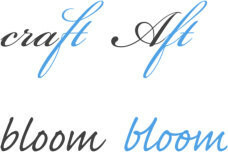 They are used to improve the legibility and presentation of text and to introduce stylistic flourishes. Ideal for designs such as invitations, cards or flyers where you need something a little bit different. Designer Pro offers comprehensive support for these ligatures including different ligature groups (standard, discretionary, historical) and stylistic sets. Designer Pro also supports advanced options such as contextual, stylistic and titling alternates, swashes and contextual ligatures. What's more the dynamic preview means it's easy to browse through the different options to select just the right effect. The default position is for all items on a page to be automatically re-positioned when you change the page size, but Designer actually offers a great deal of flexibility if you want to control exactly how particular items in your design behave. 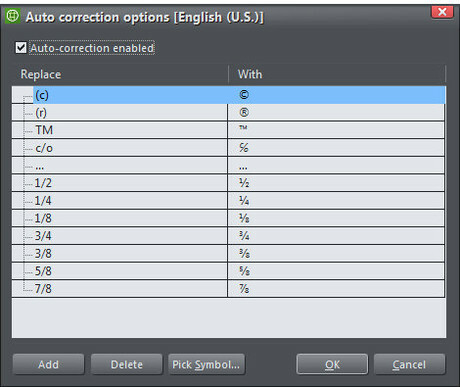 Designer Pro includes a multi-language spell checker offering check-as-you-type, word suggestions and a user-dictionary. 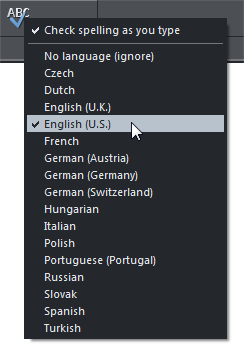 You can even mark different regions as being in different languages. Supported languages include English (US and UK), German (Germany, Swizterland and Austria), Italian, Dutch, French, Portuguese, Spanish, Russian, Czech, Slovak, Hungarian, Polish and Turkish. A powerful and time-saving new option that automatically resizes your text to 'best fit' into any shape. Forget about manually adjusting your font size, just turn on the new auto fit feature and type away - what you type will be automatically re-sized to fit. What's more it works with mixed font sizes, maintaining the relative size, and it even works with repelling borders! Using text anchors you can tie graphic objects to a specific spot in your text and they will move as the text flows, for example as you add and delete text or images above it. It's a huge time saver when you're working on documents of any length. Designer Pro also allows you to embed graphics in text using a simple Paste operation. 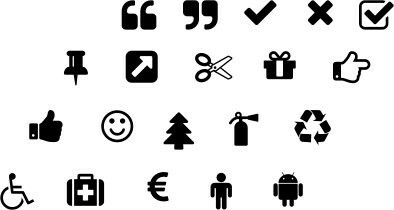 You can embed graphics 'inline', which is great for really small items such as symbols, icons etc. Inline graphics are treated just like a character in the text, in other words they flow and follow the same formatting rules as any other character. Alternatively you can determine that the text should flow to the left or right of your embedded graphic. Create your own list of abbreviations that will be automatically expanded as you type, so for example XDP could be expanded to Xara Designer Pro as you type. It's great for symbols too - for example you might set up yen to render ¥. PDF has become the industry standard way of transferring documents of all types from one person to another, ensuring exact WYSIWYG fidelity. Xara Designer Pro offers very reliable PDF import, and industry leading export of super-clean, very compact PDF files. This includes support for graduated color fills, for flat transparency and graduated transparency. And when you export as PDF everything remains pixel perfect, resolution-independent vector graphics*. The PDF exporter has also been designed to allow the files to be opened by Adobe Illustrator®, which means that vector artwork including graduated color and transparency can now be imported cleanly into Illustrator versions 9 onwards. 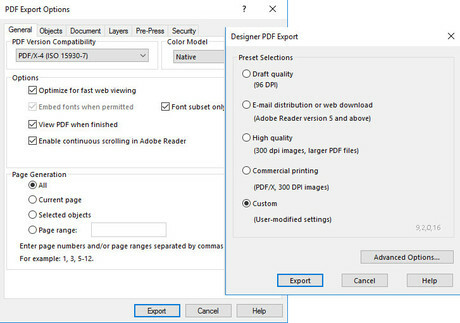 Designer Pro provides a simple choice of 4 typical PDF export profiles for the novice user: Draft, Email, High Quality and Commercial Printing. For commercial printing Designer Pro can export PDF/X. • Control over exact permissions, e.g. allow / disallow printing or commenting or text copying or extraction. Xara Designer Pro includes PANTONE® color libraries for use as both spot color and PANTONE® process color equivalents. Xara Designer Pro offers the ability to produce CMYK color separations. 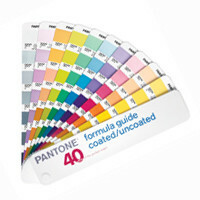 This includes on-screen preview of CMYK and spot color plates, PANTONE® color support, spot colors, on-screen printer gamut preview and a lot more. 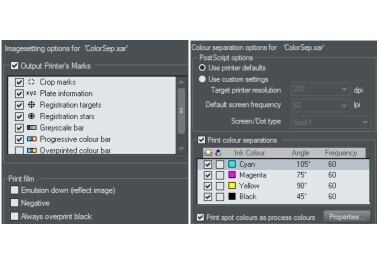 Designer is now able to produce professional CMYK print results either via PDF/X support or via direct four color and spot-color separation via the print dialog. Both options include crop and printer's marks. The direct separations printing includes control over print screening and screen types, emulsion side down and other advanced settings. Xara Designer Pro provides a wide variety of options for printing your documents. For example, you can choose paper orientation, how to fit images on the paper (including 'best fit' and 'automatic fit'), which layers to print and so on. You can display print borders and there's also a useful 'simulate print colors' option to give you guidance on how your printed colors might look (compared to on screen colors). 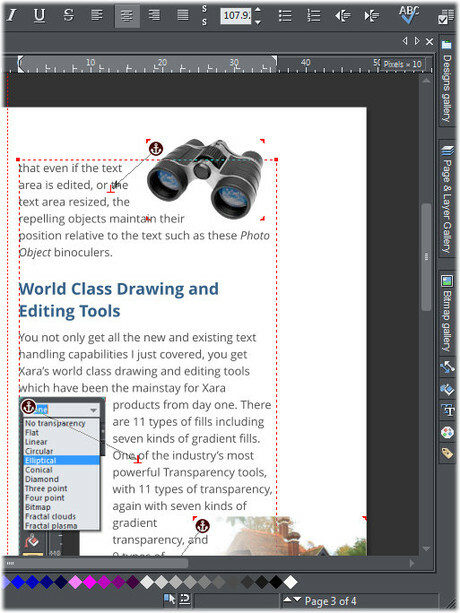 Xara Designer Pro also supports PDF and PostScript output, and full color separation support for commercial printing. With Designer Pro you can publish your multi-page print document on the web as a single scrollable document - it's easy to view, totally WYSIWYG, and perfect for fast skimming and browsing of long documents or sharing your documents with others, without the bother of PDF. Great for viewing on touch devices like iPADs. The Release Notes for Designer Pro are a good example of a vertically scrolling web document. What's more, Designer Pro includes a hosting deal, free for 1 year, so you can publish your documents for free. 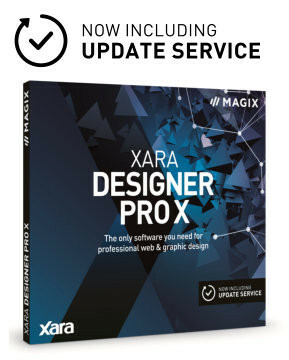 Xara Designer Pro is ideal for creating your own designs from scratch of course, but the Online Content Catalog (provided as part of the Update Service) also includes a large and varied collection of professionally designed, ready-made templates which are an absolute snap to customize with your own message. 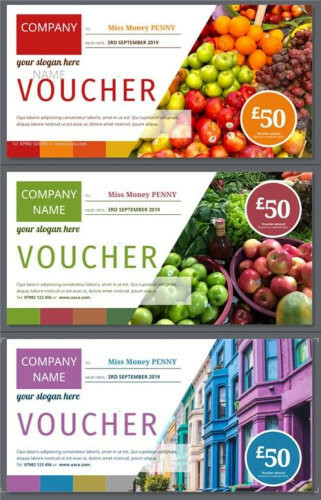 Templates include resumes, greetings cards, business stationery (letterheads, business cards etc), text panels, certificates & vouchers, calendars, brochures, flyers and newsletters. You can see previews of the templates on our site, or if you have the Designer Pro trial, you can see them in the Online Content Catalog (those in white folders can be edited, those in grey folders are there only to show you the templates you will get when you purchase Designer Pro). Simply enter your own text and/or drop in your own photo (enhanced in the integrated photo tool if necessary) and you can have professional looking results in minutes. And it's just as easy to change the colors using Xara Designer’s unique Color Linking feature (just change the master theme color and all linked shades and tones adjust automatically). All templates are designed using Linked Colors and also make good use of the Linked Stretching feature. 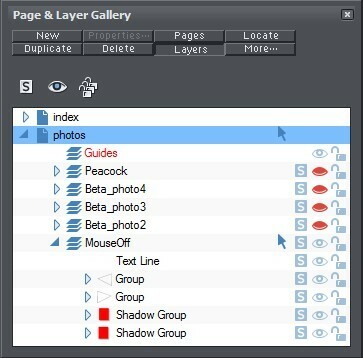 The Page & Layer Gallery is a powerful and flexible tool for viewing, re-ordering, hiding and locking not just layers, but everything from individual objects on the page to pages in your document. Everything in your document is presented in a heirarchical, expandable list. 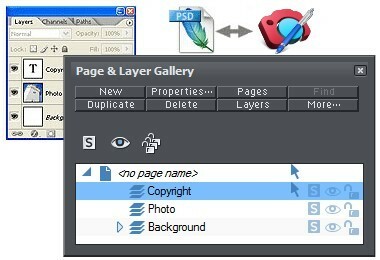 At the top level are the pages, and inside each page are the named layers of the document, and the next level shows all the objects on the page. The Gallery provides thumbnail views of all objects. The Page & Layer Gallery makes it easy to find, select, lock or hide objects inside complex drawings, or objects inside groups or even hidden under other objects on the page. The Page & Layer Gallery also includes a 'Solo' mode option which allows a specific layer to be viewed and worked on in isolation, and a 'Layers' mode which adjusts the Gallery to show just the layers for the current page. Plus there is a 'Find' mode which automatically adjusts the Gallery to find and show the currently selected item in the tree structure, collapsing everything else. Xara Designer Pro supports XPS export (and includes a beta import filter). XPS is a ‘page description’ file format invented by Microsoft. The benefit of XPS format is that it’s vector based, and so is ideal as a resolution-independent portable document format. 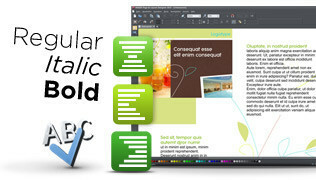 Fonts are embedded into the document and so you are assured of a very high quality WYSIWYG document. If you’re using Windows Vista or later you can view and print these documents directly. If you’re using older versions of Windows you can obtain a free XPS Viewer download from the Microsoft web site to provide viewing and printing of these files. It should be noted that the Xara XPS export does not use the Microsoft standard XPS print system, but writes XPS files directly which ensures a far higher fidelity, and far smaller XPS files. XPS supports advanced vector features such as transparency, CMYK colors and embedded fonts.